Online reviews are starting to have a greater impact on all business including dentists. In my quest to uncover the secrets of the highest reviewed dental offices in the country, I continue to come across very impressive and well-run practices. North River Dental in Ellenton, Florida is another one of these gems. I had the pleasure of talking with their office manager, Tammy, to try and document some of her tips and tricks used to grow their online reviews from 80 to over 250 Google reviews in just over one year. They keep reviews top of mind for all of their staff. They educate their staff on the importance of reviews. How they do those three things can be easily understood when you hear what a typical day is like for their office. Every single patient that comes in their office is a potential reviewer, so they make sure to ask every patient for a review. Whenever possible, if a patient is really excited and happy about their experience, they will give them an opportunity to leave a review while they are in the chair. People will typically go out and look at reviews before they go somewhere. Every now and then we received a negative review here and there, sporadically. I mean you can’t get 100 percent success with good Google reviews. We respond to the review. We ensure that we do not violate HIPAA. We apologize if they didn’t have a great experience. In some scenarios, we call the patient and leave a voicemail, and ask them to call so we can resolve the situation. Why go through the hassle of responding to negative reviews? Every time I run the report, there’s always several patients from our Google reviews. It’s hasn’t been anything substantial, but I would say I’m noticing higher numbers now. … A full mouth restoration is $44,000. You’re probably going to take a close look at the office you’re dealing with before you hand them a check for forty-four grand. 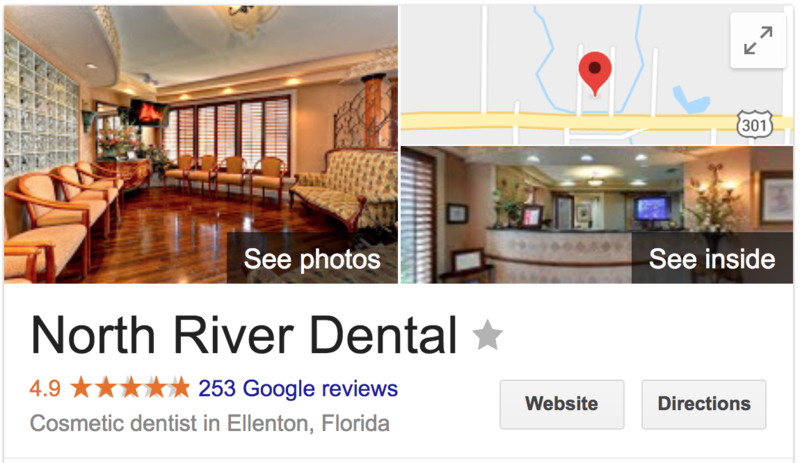 In summary, North River Dental did not get to 250 Google reviews overnight. This is something that they have been working on for several years. However, since refocusing on reviews last January, they have been averaging receiving 12 reviews per month. On January 5, 2017, they had 82 Google Reviews, and in 14 months they have gained 171 reviews.